Pomeranian Dogs and Holidays " "
Pomeranian dogs and holidays are not always a good combination. Although your dog will enjoy being a part of the fun and celebrations, there are many holiday dangers that pose a potential threat to your dog if overlooked. Alcoholic drinks – Alcohol can be quite deadly to Pomeranian dogs if ingested. It only takes a single oz. of 20-40 proof alcohol beverages to cause alcohol poisoning. Make sure all drinks are kept well away from your dog’s reaching level. Goodies – At many holidays there are always plenty of chocolate and candy treats to go around. Chocolate can be deadly to small dogs, even if only a tiny amount is ingested. Keep all snacks and goodies up high so your dog can not reach them. Furthermore, make sure you don’t offer any of these goodies to your dog. If you want to give Pomeranian dogs a holiday treat, purchase them a special dog treat and give it to them instead. Garbage – You will likely fill plenty of garbage bags when you have guests over during the holidays. Make sure you keep garbage bags secured under your sink so your dog cannot access them. If bags are full, dispose of them properly, don’t leave them lying around. Your dog could get into it and eat food that can make him sick, or ingest small wrappers he could choke on. Decorations – Pomeranian dogs are curious creatures and will get into mischief if they aren’t supervised. Therefore, you will not want to carelessly hang decorations, or make them easily accessible to your dog. Common decorations that can be hazardous to dogs if they get hold of them include: Christmas trees, ornaments (especially glass), tinsel, angel hair, ribbons, wired lights, artificial snow, etc. Aside from the actual decorations, another hazard can be the tools you use to put up these items such as staples, tape, etc. Make sure decorations are well fastened, and don’t hang any tree ornaments on the lower branches where your dog can reach. If a dog ingests decorations they can become trapped in his digestive track. Presents – If the Christmas holiday is being celebrated and presents are being opened, make sure you are watching your dog at all times. Presents that are the most dangerous are plastic toys with small parts that can be easily swallowed by Pomeranian dogs. Also, keep in mind that ribbons, bows and any other decorations on presents should be discarded once ripped off the gift. Potpourri – Potpourri is a popular form of fragrance used for the holiday season. This should be used in an area where your dog is not usually present, and should be placed up high. If your Pom happened to eat or inhale the Potpourri it can cause serious respiratory irritation, skin rash, burns and stomach upset. Potpourri is quite toxic to dogs. 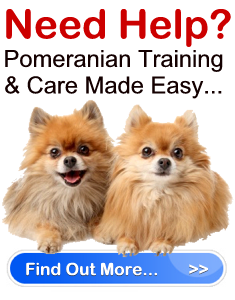 Toomuchtraffic – Pomeranians are very small and can be easily stepped or sat on. If there are too many people in one room, and there is much merry making, little dogs can be forgotten and easily injured. Essentially, when it comes time for the holidays, you need to make sure your Pomeranian dogs are safe without compromising yours and your guests’ enjoyment. This means if there are too many people around, keep your dog in a separate area where he is out of the way and you don’t have to worry about him getting into mischief that could lead to serious consequences.